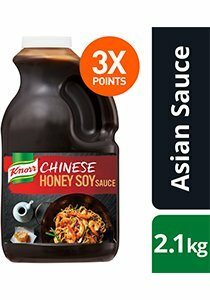 Made with honey and soy sauce to add the perfect mix of sweet and tangy to noodles, pizza, braised dishes, stir fries and dipping sauces. Sauce for noodles, pizza, dipping sauce, braised dishes, stir fry. To ensure a gluten-free meal, avoid cross-contamination with gluten during preparation. Servings per pack: 25. Serving size: 84 g.